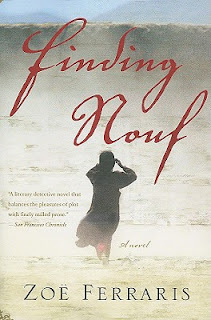 Finding Nouf by Zoe Ferraris is a mystery, but it is much more than that. It is a look into the culture of Saudi Arabia, especially the role of women in society and the restrictions placed on them. We see this through the perspective of many characters. There's the teenager, Nouf, who was about to be married. There's Katya, the Saudi woman who breaks tradition and works for a living. There's Nayir, who is so conservative that he becomes physically uncomfortable around women whose faces are not covered. And there's Nouf's brother, Othman, who seems to be content with a fiance who works. In additional to learning about the culture of Saudi Arabia, there is also the mystery of Nouf's death. Did she run away? Was she kidnapped? How involved was her family in her disappearance? Ferraris unravels the truth page by page as Nayir and Katya progress through their investigation. Some of this seemed a bit far-fetched, but it held my interest until the end. I particularly enjoyed the character of Nayir, even though I couldn't really relate to him very well. His struggles to find a wife when he couldn't even talk to women, and his compassion for Nouf and determination to find out what happened to her made me want to read more about him. The book opened my eyes to a different culture from a unique perspective, and I look forward to discussing it at book club later this week. This review is based on a copy of Finding Nouf that I borrowed from the library.